Conference organisers Emilia Palonen, Virpi Salojärvi and Marina Vulovic and the WhiKnow and MaPo teams. 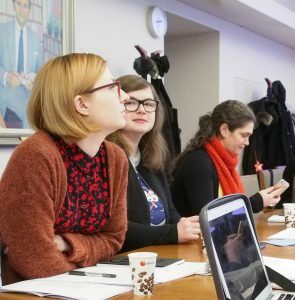 Our focus on Central and Eastern Europe was strengthened by the hiring of two postdoctoral researchers Ruta Kazlauskaite and Laura Sibinescu for 2019. Ruta works on Poland and social media, particularly emotions and Laura works on Romania and is responsible for our WP1 data gathering. Our doctoral student Lani Seelinger is covering Czech republic. Ruta Kazlauskaite, Laura Sibinescu and Lani Seelinger on a seminar break. Photo: EP. We cover in May for three weeks leading to the European elections social media data (mainly Twitter) on relevant hashtags, keywords, and the tweets from the three dimensions of our Whirl of Knowledge politics, media and research. Preparing for the WP1 has been a key issue in this period. Laura Sibinescu took part in the ECPR Methods Winter School in Bamberg to prepare with this and network with the project. Also Emilia Palonen (PI) has been travelling to several conferences to present on WhiKnow and her ongoing research. She presented the research project plan at the University of Brighton the International Concortium for Critical Political Theory, ICCPT. The conference discussed how the backbone of this project the theory of hegemony has been successfully used by the larger alt-right movements globally and it is time to reflect on the issues of performativity, rhetoricity and meaning making. The conference organisers besides Judith Butler and colleagues from Turkey, who would currently find it difficult to hold such a conference include Mark Devenney, a regular collaborator in the Helsinki Summer School courses. 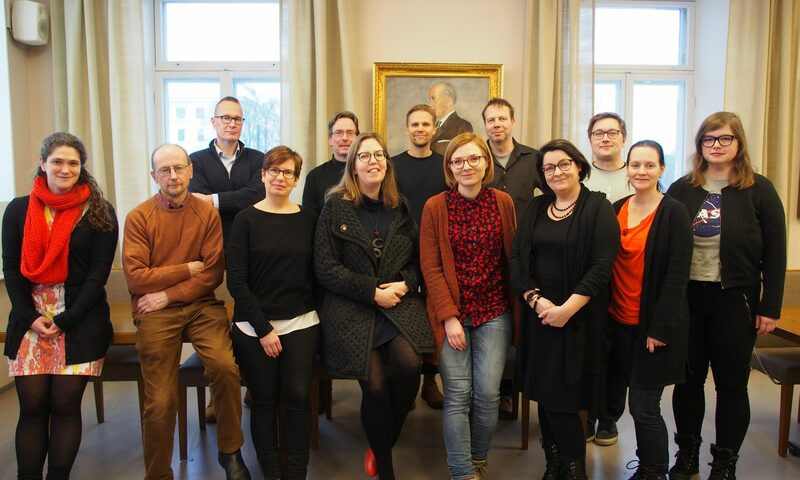 In February Palonen took part in a Discourse Theory Ways Forward conference in Brussels organised by DESIRE research group at the Free University Brussels. This conference discussed how particularly the Laclaudian framework of discourse theory would advance. Emilia discussed with the keynote speaker Ruth Wodak, Edina Doci and the chair and one of the local conference organisers, Jana Goyvaerts, the role of women in discourse theory and populism in a popular session the first day of the conference 7 February. The discussion is available online. Palonen also presented at the plenary panel 8 February on Rhetoric-Performative analysis and Populism. The 16-minute presentation is a tour de force of Palonen’s long standing argumentation on populism, public space and discourse and polarisation, with newest developments the logical formula of populism and discussion on representation, democracy and demography. You can watch all the plenary panels online on the DESIRE you tube channel and Emilia’s plenary presentation and the panel here. Also project member Taavi Sundell took part in the conference on higher education policy analysis. It was a great conference for connecting new and established scholars on the field of discourse theory, particular thanks to Benjamin de Cleen for organising. Much collaboration would follow, and the remarks by the keynotes Wodak and Michael Freeden will be pushing the field forward. 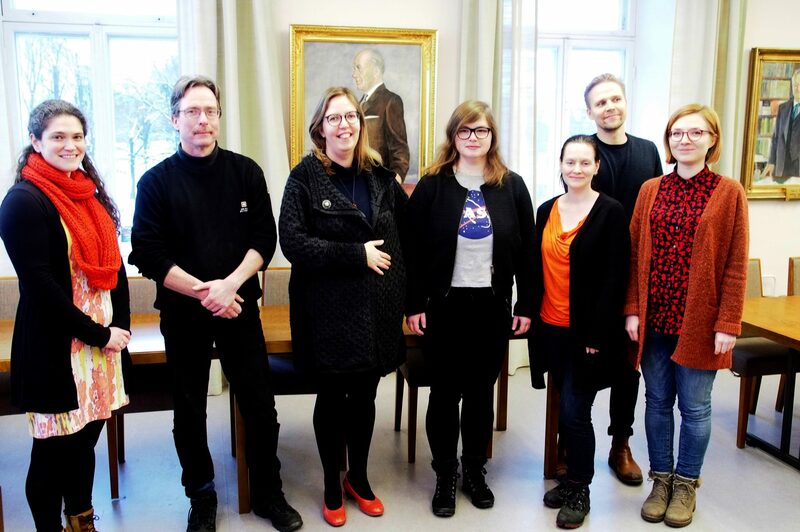 MaPo and WhiKnow teams meet at the Faculty of Social Sciences, University of Helsinki. 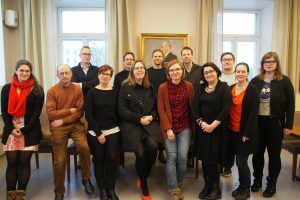 The Mainstreaming Populism in the 21st Century (MaPo) Academy of Finland Consortium with researchers from Helsinki, Turku and Jyväskylä and the Helsinki-based WhiKnow project met for the first time 1 February, establishing collaboration between projects. This seminar discussed work in progress from several participants, articles from postdocs, PhD thesis and a ERC application. The seminar was organised by Juha Herkman, the PI of MaPo, and meeting between different hubs of activity was a pleasant one. Future collaboration will take place in a joined conference 19-20 August. Last week of February Palonen visited Hungary, one of the core countries for MaPo, where she leads a workpackage on Populism and Democracy, and for WhiKnow. Both projects’ partners are the Hungarian Academy of Science, which the Hungarian government has been planning to close down as a research institute. It was an interesting time to visit Hungary and the partner institution. This was a very fruitful process in terms of contacts, seeing both long-term collaborators and generating new ones for the project at the Institute for Political Science. The political communication scholars Gabriella Szabó and Balázs Kiss are looking forward to collaborating with WhiKnow. Our WP3 leader Mikko Salmela and Kiss already had discussed the study of emotions together. We share a mutual interest in the similar themes and approaches. We discussed intensively the practicalities of the WP1 as our first priority, we discussed the dilemma that Twitter is used across Europe but it is not at all used for Hungary and little used for Romania. How then to include Hungary in such as study where elsewhere we can rely on Twitter data for the elite-level data gathering we are conducting in WP1? Further issues we discussed is the change in data-gathering policies as around the time of the submission of the first WhiKnow proposal it was still allowed to automatically withdraw data from Facebook while now this can only be done manually. In March we are establishing our data-gathering tactics, with virtual visits of researchers abroad over skype link. We also take part in conferences, and organise a WhiKnow-MaPo session at the Finnish Political Science Association Conference in Rovaniemi on populism and polarisation. 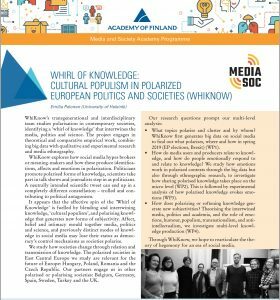 The four-year WhiKnow project started in the beginning January, and we look forward to the four years in the Media and Society programme of the Academy of Finland. 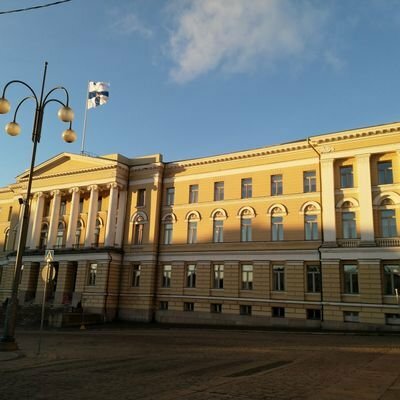 We are based at the Faculty of Social Sciences, University of Helsinki – whose main building is featured here in December 2018. For communications, we tweet on whi_know and with #WhiKnow hashtag. More updates on the project and the progress of our research on this website. WhiKnow´s trans-generational and interdisciplinary team studies polarisation in contemporary societies, identifying a ´whirl of knowledge´ that intertwines media, politics and science. The project engages in theoretical and comparative empirical work, combining big data with qualitative and experimental research and media ethnography. WhiKnow explores how social media hypes brokers or meaning-makers and how these produce identifications, affects and emotions in polarisation. We first generate big data on social media to find out what polarises, where and how in spring 2019 (EP elections, Brexit). Then we conduct ethnographic research in polarized societies in East Central Europe, and in other polarised/ing societies. This is followed by experimental analysis of emotions and theoretically informed study of the intertwined media, politics and academia, and the role of emotions, humour, populism, transnationalism, and anti-intellectualism in these processes.